The CAB service has a unique role in Scotland. No other charity offers direct help to so many people over such a wide variety of problems and across the whole of Scotland. Our on-the-ground experience and extensive evidence base puts us in an ideal position to set out a vision for how Scotland should use its new social security powers. The aim of the social security system should be to provide a coherent, fair safety net for the citizens of Scotland in order to achieve a more equal and socially just society. Ultimately, every Scottish citizen should be able to access the essentials for living and be treated in a dignified manner by society. Citizens Advice Scotland (CAS) has been working with our member bureaux across Scotland to consider how these new powers could be used. In doing so, we have been able to draw on the considerable experience of Citizens Advice Bureaux (CAB) in supporting clients through the social security system: in 2014/15, our CAB network dealt with 220,000 new benefits and tax credits issues representing 37% of their work. 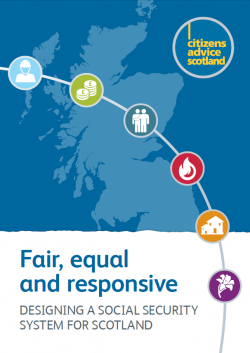 The devolution of these new powers offers a vital opportunity to begin to craft a fair, equal and responsive social security system for Scotland. This paper sets out our overall vision of how this could be achieved. Further and more detailed recommendations on each of the areas listed above can be found in the accompanying reports below.